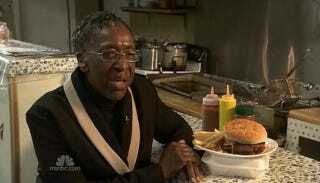 Sixty-seven year old Ann Price is known for her grill skills, and her "ghetto burger" has made her Atlanta "snack bar" famous. After serving up patties for almost forty years, she'd like to retire… but isn't sure she can. The crappy real estate market is having a big impact on Miss Ann's plans. Maybe she should have some kind of burger eating contest slash fundraiser? There must be some ground beef company out there with a million bucks to invest.